Click this link to write me about this painting. Malibu Creek State Park as seen from a high overlook – on one of the highways leading into the area. In the early springtime, the grasses are just starting to green up. These peaks are well known landmarks in the area. 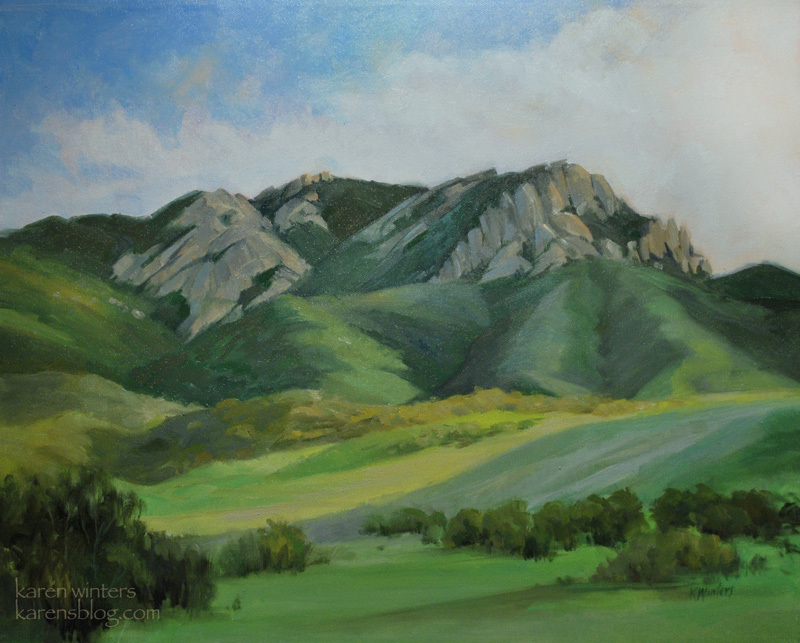 My latest painting, finished just in time for the Artwalk in Thousand Oaks next weekend in the Conejo Valley. Mt. Boney is part of the Santa Monica Mountain range, and is an imposing formation with sheer faces. I think it looks especially nice in afternoon light when the late sun reflects off the faceted planes of the rocks. Late afternoon sunshine touches the soft foliage of California live oaks, growing by a country road. There are many parts of the state that still have rural charm, not far from the city. When I was growing up, my father liked to take us for a ride in “the country” on weekends. I think he missed where he grew up, in the Southeast US. 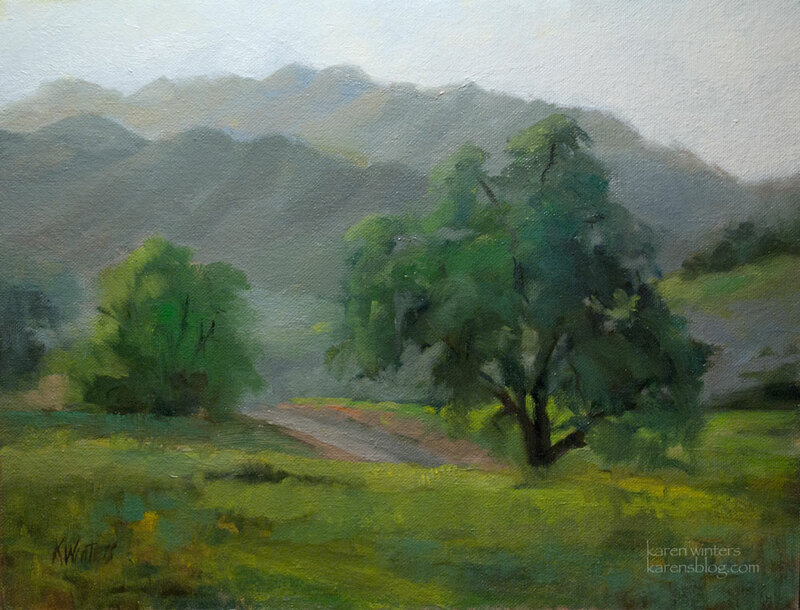 Sometimes we’d go up small roads surrounding the San Fernando Valley. When I was a child I couldn’t understand the appeal of Sunday drives. But when you’ve been cooped up in a workplace all week, I now understand how it must have restored him. 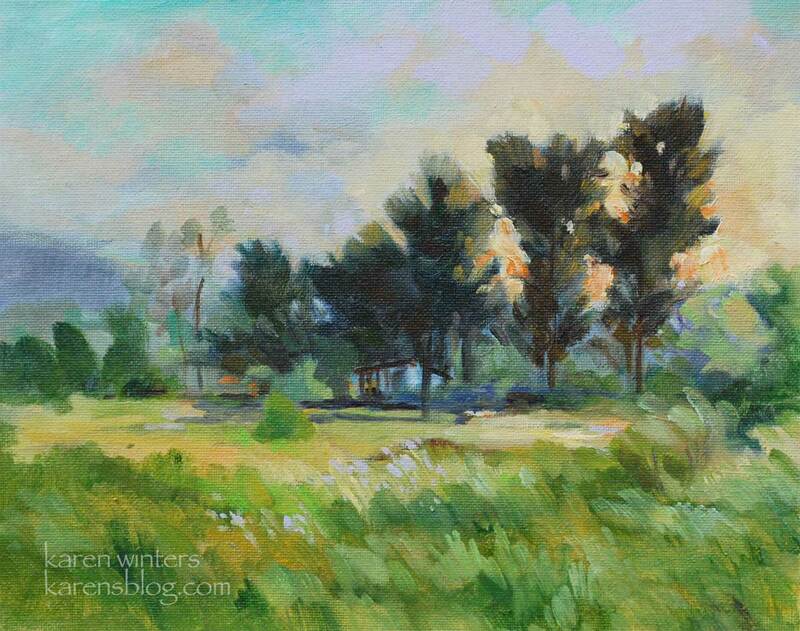 Plein air painters are fortunate folk. Our workplace is along the byways and backroads. We are blessed to be here. At Leo Carrillo Beach, I came across a rock that had a flock of cormorants roosting briefly before their next fishing mission. Their silhouettes against the fading sun intrigued me, and I thought they made a nice composition. A wedding was underway just the other side of a big rock structure, a beautiful sunset setting. I thought at first they were pelicans, but I was mistakden. This limited palette painting was fun to do. The rocks take on different colors depending upon the lighting conditions and time of day, which presents a lot of creative possibilities. California’s Brown Pelicans have been in the news recently as sick and dying birds have been found a distance from usual home. Their feathers are often discolored with some unknown substance. Whether is the result of red tide (algae bloom) or some other pollutant is unknown. A similar die-off happened around February of 2009. One supposition is that weather and oceanographic influences may disrupt the pelicans usual feeding patterns, causing them to starve and weaken. El Nino conditions may be a contributory factor. These birds were on home turf and looked well-feathered and plump. I love to watch them flying just over the waves, single file. 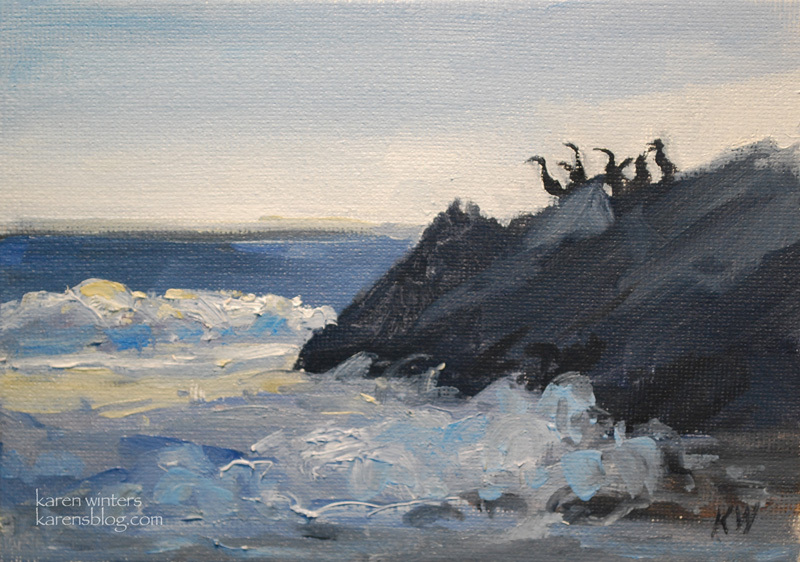 This little study of the surf at Malibu gives you some idea of the subtle range of colors that emerge on even a somewhat hazy day. The water can appear silvery and opalescent under the right conditions. And those conditions change from moment to moment. California impressionist and Laguna painter Frank Cuprien was especially adept at capturing those fleeting tones in his oil paintings. There’s a lot to be learned from studying the masters, first-hand. 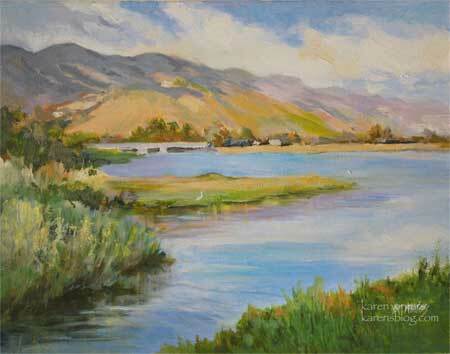 I’ve enjoyed seeing his works at both the Laguna Museum of Art as well as the Irvine Museum. For more information about this painting, please write. Of course, I grab every opportunity to paint that I can, and sometimes those opportunities come at unusual times. 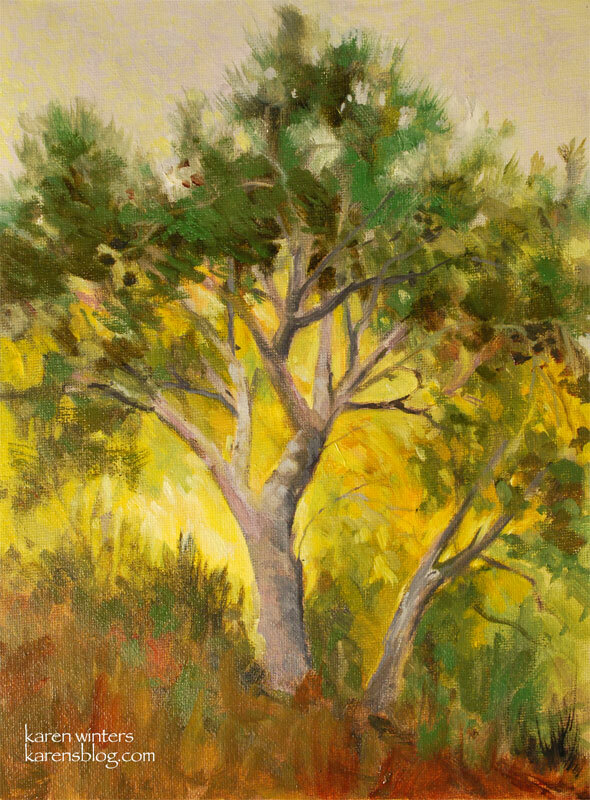 This pine tree was painted during the Malibu Allied Artists show a week ago. I set my easel up by my display area and looked around for something paintable. Although the day was mostly gray, the sun came out a few times and illuminated a hillside behind this tree. There wasn’t much of a vista, so we’ll just call it a tree portrait. I was told by a man who does landscaping that it is an Aleppo Pine. Upon doing a little research about it I came upon a wikipedia article that claims that an Aleppo pine was the inspiration for one of Cezanne’s paintings. Their sculptural forms are certainly appealing. Because the sky was an interesting combination of warm and cool lavender that day, I opted to borrow an impressionist technique of using complements of the same value in the sky area. Enlarge the image by clicking and you’ll see what I mean. When I’ve visited the Irvine Museum, I’ve seen this approach used to great effect by a number of the California impressionists. I like how it added a bit of a glow to the atmosphere. I’ll be posting more new work soon. 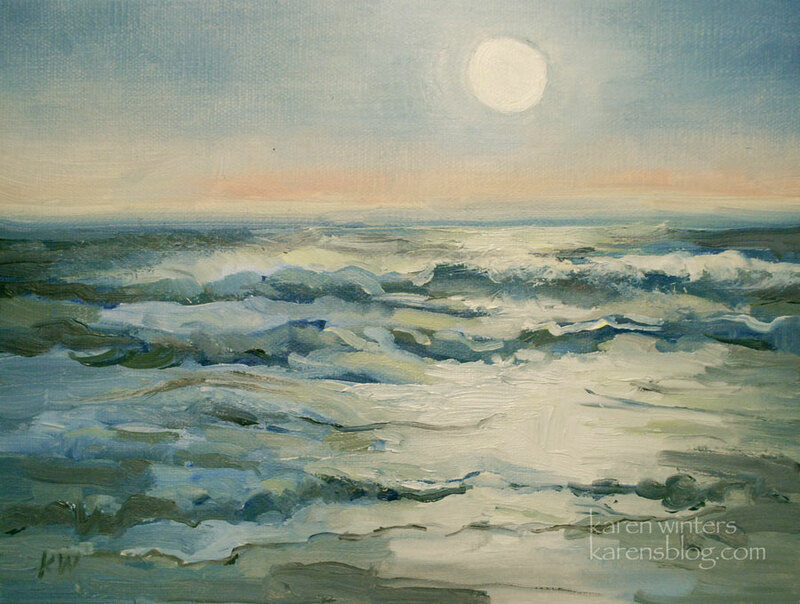 If you’ve been thinking of a commissioned painting for a holiday gift, now’s a good time to get in touch. I currently have three works in the queue, but there is plenty of time to create a portrait, house portrait, landscape or seascape for that special someone. The ideas are just endless if you think about special moments, places, people and things. 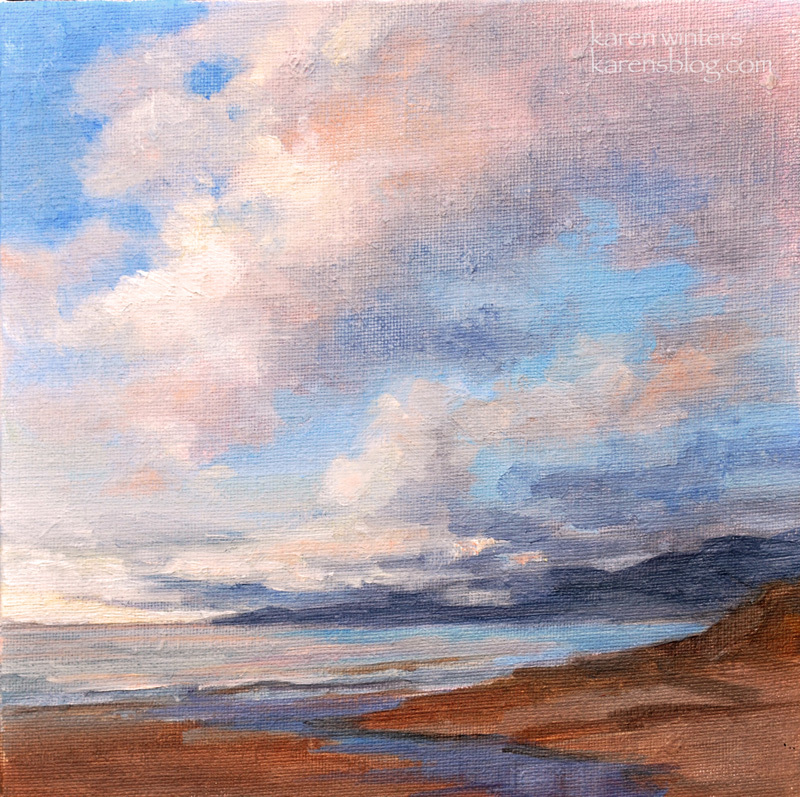 This is one of the paintings I’ll be bringing to the Allied Artists Art Show and Sale this Sunday, October 18 at the Malibu Nature Preserve, 33905 Pacific Coast Highway, Malibu. It will probably be one of the last big outdoor shows of the season, so I hope that you’ll have a chance to come out and enjoy the weather at the coast. I was up in the Sierra last week, but we got rained out, so I hope to return again in a week or two, as we did last year. Mark your calendars for the annual Pasadena Art Walk, Saturday, October 10. 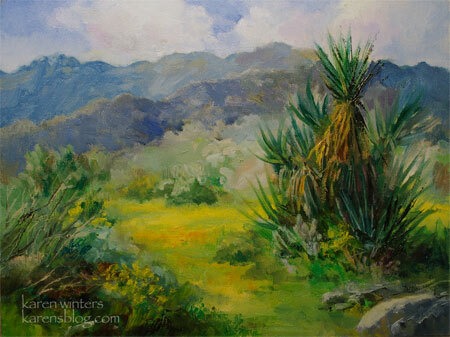 A visit to the Anza Borrego Desert State Park inspired this painting of yucca and desert wildflowers. When the rainfall is sufficient and in the right quantity and at the right time, the color is breathtaking, even though short-lived. 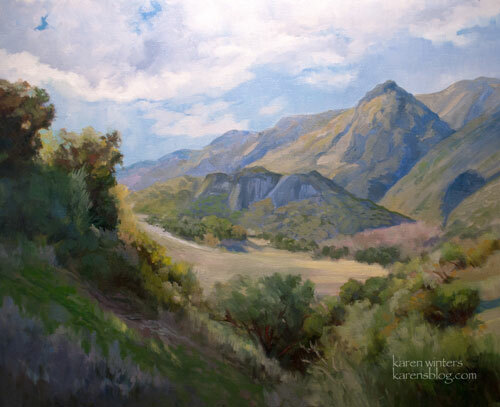 Tomorrow is the spring group show and sale of Allied Artists of the Santa Monica Mountains and Seashore, and I’ll be showing about 15 paintings including many that have not been exhibited before. The show starts at 11 and goes through 5 pm at Headwaters Corners, at the intersection of Topanga and Mulholland Drive in the Santa Monica Mtns. If you get a chance come on out. I’m going to be finishing up my framing and packing for the rest of today. Come on out if you’re in the area. Art, beautiful weather, friendly artists and refreshments.